Toronto is just under two hours away so we go there pretty often for concerts and events. This time we pretty much just went for the food. We normally stay at the Westin Harbour Castle on Queens Quay near the harbourfront. It's a great hotel but the neighbourhood historically wasn't the greatest for food and drink. It's a close enough walk to St. Lawrence Market though, and we'd usually stop into C'est What or the Bier Markt on the Esplanade for drinks. But now there's a new place for beer at the harbourfront. The Amsterdam BrewHouse is a huge new brew pub on the lake. The atmosphere is great and they have Amsterdam beer on tap and special bottles as well. It's a very nice addition to the area. But when we first arrived, before we checked in to our hotel, we were in search of tacos. There's a bit of a taco renaissance going on in Toronto right now, and you know how we love tacos, so we had to check some out. Playa Cabana Cantina in the Junction neighbourhood came highly recommended. The signage is limited out front but the food inside is fantastic. First we had some drinks, chips and salsa. I had my favourite Paloma cocktail and Matt had a Mexican beer. We tried the green salsa, which was delicious. We tried five different tacos and shared bites as best we could. Up front is the Pollo Tinga, chipotle chicken on a crispy tortilla. Behind that is La Truck - Kalbi beef with citrus slaw. Both were amazing. At the recommendation of our server, I ordered the Venera Frita - fried scallop taco with grapefruit salsa and it was a great choice. The scallop was crisp and tender and the salsa was perfect with it. I also had the taco Al Pastor, which was really tasty but not my favourite. Our favourite was the Pulpo, which is chipotle grilled octopus and it is outstanding! It is smoky and spicy and delicious. You've gotta try it if you're in the city. 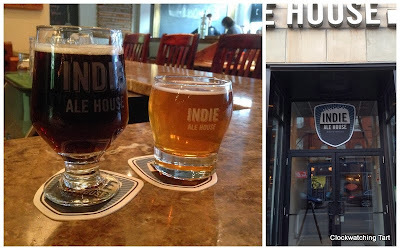 Across the street from the taco shop is Indie Ale House where we stopped for a beer brewed on site. It was pretty tasty! That evening we visited our new favourite Toronto bar, Bar Hop on King West at Spadina. We'd been in once before for drinks and snacks and the craft beer selection is incredible. This time we had dinner and the food was pretty terrific too. I started with some oysters that were just great. I'm really starting to love oysters. Besides the oysters, the pub has a daily savory pie, which Matt enjoyed. It was smoked chicken. Tasty! I had the Berkshire pork chop and it was fabulous. I love those little mushrooms. The service here has been great for us. It gets busy on a Saturday night but it is totally worth the trip. We hope to visit as often as we can. I had some great cider with dinner and afterwards I had something I've never tried before: a bourbon flight. It came to the table in a wooden box and included Bookers, Bulleit, and Maker's 46. I am trying to expand my palate when it comes to dark liquors so this was a tasty way to try some new things. Finally, the next day for lunch we returned to another favourite: Wvrst. This place has wonderful house-made sausages and a nice craft beer selection as well. This time I tried a Tamworth pork sausage and Matt had Bison with blueberry. We shared an order of dirty duck fat fries covered in onions and peppers. A fantastic end to our trip to Toronto. We'll be back soon.